Trigger Warning: This post contains mention of sexual assault. Saints and Misfit by SK Ali – via PRISM International. Then, I knew I needed this book before I even knew what it was about. For those of you who have never worn an Islamic bathing suit, this is EXACTLY how it feels and sounds, like to wear one. Someone out there knew what it was like, and it’s an amazing feeling to read yourself on a page. There’s an instant connection, rather than a feeling of longing. Immediately, I felt invested in the character and excited to see where the journey would go. 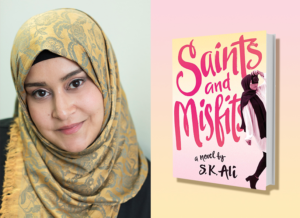 Saints and Misfits is the debut Young Adult novel by SK Ali. The book tells the story of Janna Yusuf, a 15-year-old hijabi Egyptian-Indian American Muslim, and the aftermath of her sexual assault at the hands of her best friend’s cousin. The cousin or “Monster” as Janna refers to him, is a pillar in the community because he’s memorized the Quran. In the wake of the #Metoo campaign, this novel feels all the more important. The focus is on a Muslim sexual abuse survivor, and how she lives with the secret of her abuse while having to not only interact with her abuser, but listen to people praise him whenever he’s mentioned. In the book, Janna tries to navigate how to live with the Monster’s ever-suffocating presence while living her life. She’s further dealing with family problems: her parents are divorced, her brother, Muhammed, just moved back home forcing her to room with her mother, and he’s pestering her to be a chaperone on his dates with a girl she has dubbed “Saint Sarah” because she’s what Janna thinks is the perfect Muslim. Oh! and she has a crush on a boy at school named Jeremy. Saints and Misfits is delightful and important book because it presents a critique of a Muslim community from within. Its portrayals of the different types of Muslims, show that we are not a monolith. 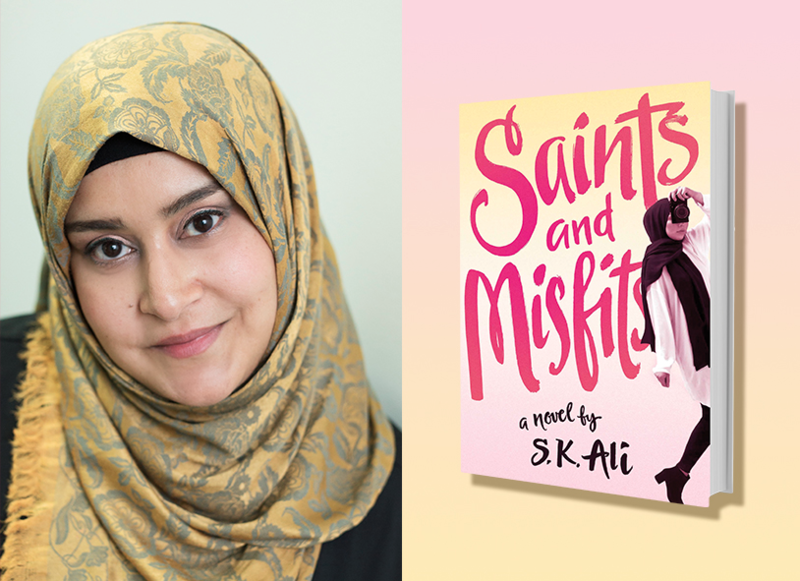 Saints and Misfits is a character-driven story, and Ali does a great job of smashing through tired stereotypes effortlessly. For instance, Janna’s secular father thinks his ex-wife is forcing Janna to wear hijab, but the author makes sure to emphasize that it’s Janna’s choice. There is the Doc Marten wearing, no holds barred, Sausun, who decides to wear niqab and Janna feels like “she looks like she’s excused herself from the proceedings of life’s unnecessariness” But we’ll learn later this is far from the truth. Throughout the story, we also learn that the previously mentioned Sarah may not be the “saint” Janna believed her to be, after all. Hence, no character is a caricature or one-dimensional. That’s why it’s so important to have Muslims writing Muslim characters. Janna’s relationships with her parents and brother, Mr. Ram, her 90 something year old Hindu neighbor she looks after, and her schoolmates are so refreshing in their mundanity. But in a book full of fully rounded and endearing characters, Tats, was my favorite. She reminded me exactly of my best friend in high school. The non-Muslim best friend who doesn’t really get Islam but totally has your back regardless. The one that convinces you to “live a little” from time to time, but backs off when you come to your senses. I just loved her so much. The interactions between Tats and Janna felt so real to me because, I felt like I lived those moments. Ali’s style draws the reader in, takes them on a journey of laughs and frustration and tears. And underlying it all, there is this stomach clenching tension that comes whenever the Monster is mentioned or appears. Janna struggles with revealing her secret but she knows “she can’t tell [her cousin] because she’d never believe such an unholy thing.” The “of him” goes without saying. Like most cases of sexual assault, the burden of proof falls on the victim, and Janna is no different. Saints and Misfits does not tie all loose ends into a neat, little bow. By the end, some readers may feel let down by the incomplete resolution. To me, it felt like real life. It felt like a step toward healing. Throughout the novel, Janna thinks of herself as a Misfit and an outsider. But as her assault comes to light, she’ll find that she’s had people in her corner all along. Janna is still learning and she’ll question a lot things about herself and others, but her Islam is not one of them. That was the most refreshing part of all. Finally! Muslims make mistakes. It doesn’t mean they regret being Muslim. It just means they’re human. Read this book! Share it with Muslim teens who need to see themselves in media. Inclusivity and representation of the Muslim community make this book a must have for Muslims but its discussion of sexual abuse and its aftermath make it a must have for everyone. Saints and Misfits has been nominated for awards and landed on multiple “Best of” lists. It is well deserved.